Denim. Aside from jeans, anything made in this hard wearing fabric was pretty much the definition of passé until very recently. At the spring/summer 2015 shows, designers delved head-first into redefining the fabric, keen to reposition it as on point and stylish, rather than simply something hardy enough to hold together through years of toil. From light to dark washes, trim to oversize fits, 1990s distressed to sophisticated selvedge, denim isn’t just a byword for jeans this season – read on for a full breakdown of the trend and the key pieces you should be looking to introduce to your wardrobe this SS15. 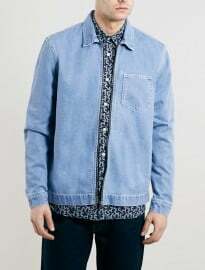 Invented in the early 20th century and developing into a casual wardrobe staple just a few decades later, the denim jacket is well and truly back for spring/summer 2015 – not that it ever really went away, if we’re honest. Yet there’s something altogether smarter about the denim jacket this season, with designers like Christopher Bailey at British luxury label Burberry Prorsum plucking the age-old classic from its humble origins and repositioning it as a more sophisticated piece. In Milan, Miuccia Prada’s fairly sober collection of time-honoured classics came over all denim – despite the fact that a lot of was not. It was Prada’s topstitch detailing, applied to outerwear and trousers, which gave both denim and non-denim jackets that immediately discernible denim appearance. Also eager to elevate the denim jacket was tailoring aficionado Patrick Grant, whose British seaside-inspired collection was awash with selvedge denim jackets in silhouettes that ranged from blousons and blazers to something that resembled a field coat. Channelling something similar but more subversive was Andrea Pompilio’s ‘homage to punk’: a sportswear meets tailoring collection interspersed with denim, including a look that saw a denim jacket worn over a luxe sweatshirt, which was in turn layered over a denim shirt. Taking the denim jacket ever so slightly further back to its roots (the 1970s, to be precise) was Hedi Slimane at Saint Laurent. From now through to the start of summer, your trusty denim jacket will make an excellent layering piece. However, think about how you can utilise it in slightly unconventional ways (under a blazer or mac, for example), rather than as a traditional top layer. While chambray shirts have worked their way into many of our wardrobes over the past few years, 1990s-esque styles have been about the furthest thing from fashionable. Until now, that is. Tom Ford – he of seductively luxurious suiting and evening wear – suggested denim as the new fabric for formal engagements. OK, it’s not exactly wedding-appropriate, but Ford made a convincing case – showing a suede jacket layered over a faded denim shirt, which was tucked into a pair of washed straight-leg jeans and accented with a patterned, neatly positioned neck scarf. Though often not actually using the material itself, Silvia Venturini’s spring/summer 2015 collection for Fendi was in parts a homage to denim, including a zip-adorned, biker-esque jacket that looked like it was crafted from denim, but was in fact made from bonded leather. Parisian brand Kenzo was particularly enamoured with denim this season. Co-creative directors Carol Lim and Humberto Leon showed a collection predominantly made up of pastels, punctuated by full-on denim looks: a belted denim coat layered over a button-down shirt with a pair of slim jeans, or a faded double-breasted denim jacket buttoned-up over a white button-down shirt, and worn with a pair of matching faded denim jeans. It seems jeans are the new trousers. While chinos, linen legwear and sports luxe sweatpants may have been the go-to styles in recent seasons, spring/summer 2015 sees denim dominate in looks from smart to casual. Kris Van Assche went a step further at Dior Homme, not just teaming jeans with smarter separates, but jeans that were decidedly 1990s due to their distressed appearance and plain, straight cut. While traditional tailoring and luxe leisurewear are two dominant forces in menswear currently, designers are gradually making room for fabrics that don’t sit firmly on the suiting or sportswear end of the spectrum. Tough as nails and extremely versatile (as some of these more eye-catching looks have proved), it’s little wonder that, this season, menswear’s tastemakers are redefining denim.